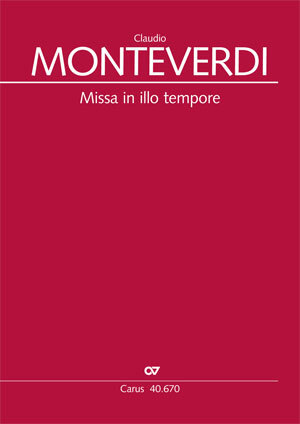 Monteverdi's Missa in illo tempore for six voices, together with the Vespers form a collection of church music which was printed in Venice in 1610 and dedicated to Pope Paul V. During the period of transition from the older [16th century] polyphonic style to the new concertante style Monteverdi displayed his compositional abilities in this collection using both means of expression. Whereas the Vespers contained, for their time, the most modern concerti, contemporaneously the Missa employed the already obsolete genre of parody mass based on themes from a motet by Nicolas Gombert; it was composed consciously in the stile antico. The vocal parts are accompanied by a basso continuo treated as a basso seguente.